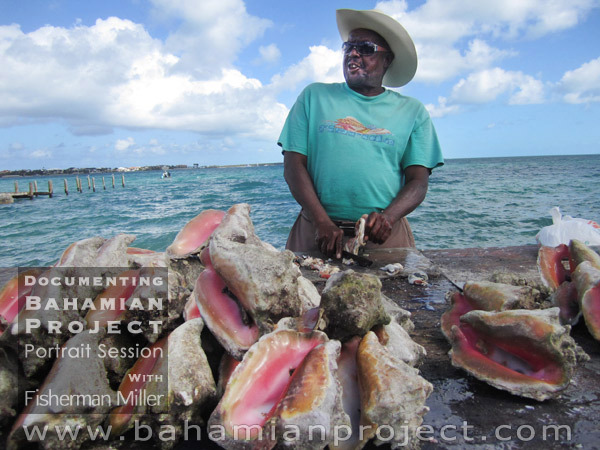 This picture of Mr Miller was taken at his conch stand at Montague beach. 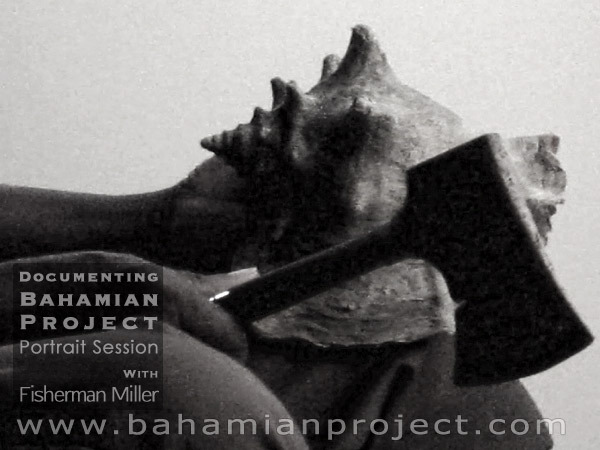 The final portrait images will be on display at the National Art Gallery of The Bahamas in an exhibit opening July 11, 2013. 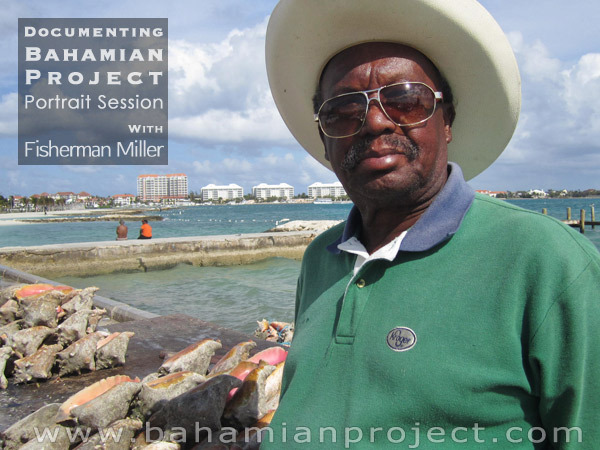 We first encountered fisherman Algernal Miller at his seaside office — a prosperous conch stand set against the backdrop of the ocean at Montague beach. He has been in business there since 1982, he said, and proudly boasts that his conch stand was the first of its kind at Montague. 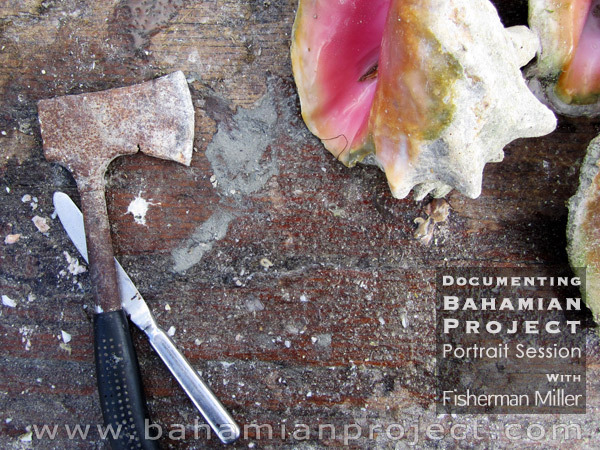 Eventually the spot became a popular location for fisherman to sell fresh fish and conch. Additionally, it has become a local landmark of sorts. 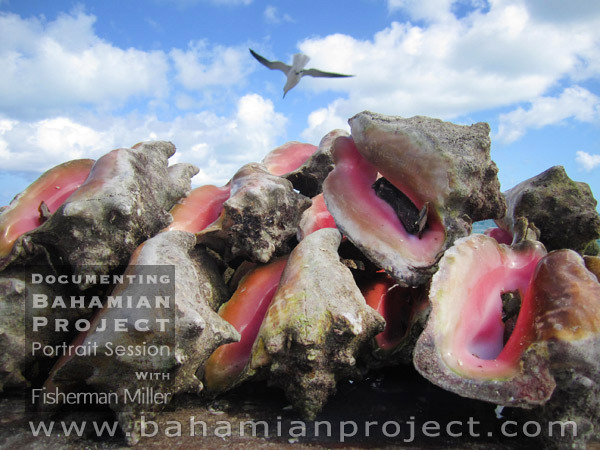 His ocean-soaked weatherworn wooden table was laden with neat stacks of conch shells – pink-hued insides all facing upward – a vibrant display of colour against the greens and blues of the sea. In his white rubber boots, cowboy hat and sunglasses, Mr. Miller paints a colourful character himself. He is an immensely friendly man who has built a good reputation and a loyal customer base. 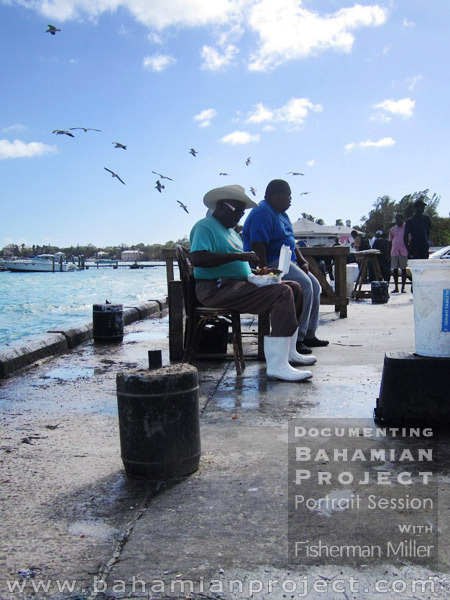 With the sea breezes blowing and seagulls clamoring overhead we explained to him what we were doing with the Bahamian Project, inviting him to come to our studio to be photographed. He smiled and with a nod of his head he humbly agreed. Then he lifted his trusty little hatchet and, with ease and obvious skill, demonstrated how to extract the conch from the shell. We staged the set at our studio to symbolize Mr. Miller’s work environment. 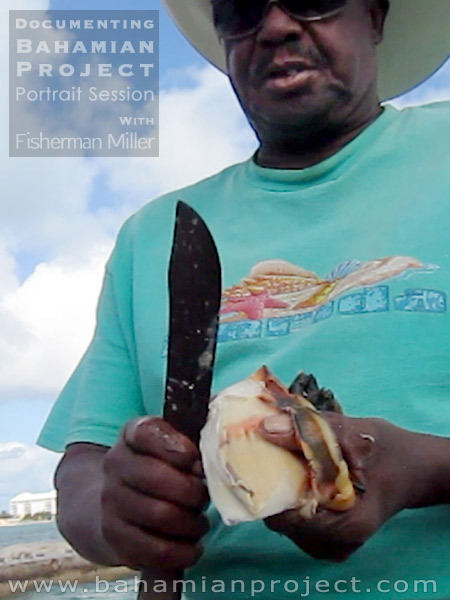 Positioned atop a throne of conch shells and armed with his hatchet, we captured Mr. Miller’s weathered charm and his friendly signature crooked grin. Documentary photos by Matthew Cromwell. These are not the final images.